cooler than at the coast. Unlike larger workshop centers, the Hui hosts only one workshop at a time, allowing for an atmosphere of intimacy and calm. Rooms are double occupancy. Your instructor will determine room arrangements for singles and couples. All bathrooms are also shared, including our two outdoor shower houses. Your experience will be simple and close to the earth. Be prepared for the natural surfaces and uneven walking trails on the property. This requires some fitness and a willingness and ability to hike short distances up a 20% incline. Please be aware that the Hui Ho’olana is set in a camp-like environment, and that our facilities are not fully accessible for individuals with some types of disabilities. The access to most parts of the center is via natural-surfaced foot paths of up to a quarter mile on a moderate incline. Guests will need to take personal responsibility for their own physical abilities and use flashlights for lighting during the nighttime hours. You will be asked to sign a liability release form when you arrive. Ohana offering is a practice of offering time in support of the household needs of your retreat and is an intrinsic part of living in community. Staff and guests all participate in karma yoga on a daily basis. You will each be given a small job like sweeping a deck or wiping the tables after meals. It is a fun way to feel truly a part of your group experience, and our small staff of volunteers greatly appreciates your willingness to contribute and participate in this way during your stay at Hui Ho’olana. The Hui is known for its delicious and healthy cuisine. Three freshly prepared meals provide a wonderful cadence each day. 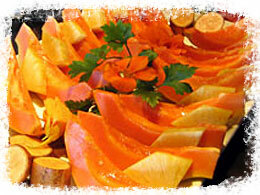 Our garden provides many of the vibrant herbs and vegetables used by our professional cooks. Meals are mainly vegetarian, though supplemented by eggs, chicken and local meats. They are created and served ‘family style.’ Most of what we serve is organic and wheat-free. Living on a remote island, menus are necessarily planned and shopped for in advance and based on local availability and seasonality of foods. We are therefore generally not able to accommodate special diet needs or preferences. If you are on a very specific or restricted diet consider bringing items you need to augment your meals as shopping on Molokai is very limited. If you have any life-threatening food allergies, such as peanuts or shellfish, please let us (as well as your instructor) know a month before you come so that we can do our best to help you guard your health and enjoy a week of wonderful food. One of the most important things guests have learned over the years is PACK LIGHT! You need very little here. Pack so that you can easily carry your luggage up a staircase or down to your cabin. We do supply bath and beach towels. 2-3 light changes of clothing These can be rinsed out and dried easily. Something warm Our cool evenings can be cool, so bring something like a fleece jacket and a pair of warm socks. Slip-off shoes or sandals It is the Hawaiian custom is to remove your shoes before entering a home. A flashlight, You will be walking on paths at night with minimal or no lighting. Toiletries and sun screen – Island shopping is limited. Insect repellent Mosquitoes can be out at certain times of the year, so bring an insect repellent if this concerns you. Herbal products made with eucalyptus oil work well for many people. A light rain jacket if coming during winter months. Either cash or US checks, Although we do take major credit cards in our gallery, other services may not. So it is recommended that you bring a few personal checks and enough cash to cover optional activities. The chlorine-free outdoor pool uses ionization for a crystal clear and odor-free swim by day or night. A dedicated massage room allows for relaxation and body work in pleasant surroundings. Our massage therapist asks for cash only. Several outdoor tubs provide the opportunity for a refreshing soak twenty-four hours a day. Our fully enclosed workshop meeting space is located quietly distanced from the main lodge area. The Peace Pavilion provides a covered, open air facility perfect for meetings, dancing, and other activities. The multitude of stars put on a wondrous display in our nighttime sky, and our sunsets are often glorious. If you are interested in spending a night or more on Molokai before or after your workshop, there is one hotel on the island, Hotel Molokai. Other accommodation information can be found at VisitMolokai.com and molokai-hawaii.com. Trip Insurance is recommended. One company you may want to try is CSA Travel Protection. They can be reached toll free at 800.711.1197. On arrival day, please arrive after 2pm. Before then, we are preparing for you and we cannot accommodate early arrivals. Check out is by 11:00am on your departure day. Your timely departure is appreciated, as we are unable to host guests on site after 11:00am. Please plan your travel arrangements accordingly. Be sure your instructor knows your arrival and departure times. (They will be sending you an on-line sign up so we have all your updated information). If you have extra time before arrival or after departure, lunch over the beautiful view at the Hotel Molokai or coffee at Molokai’s ‘Coffees of Hawaii’ plantation can be a pleasant start or end for your week on the island. Other choices are Paddler’s Inn in Kaunakakai or the Cookhouse in Kualapuu, just a mile away from the Hui. However, all these places seem to open and close at will – Hawaiian style – you just never know! Call before your trip to see what is available. 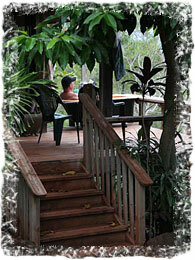 Depending on where you are flying from, you may choose to spend a night on Molokai before or after your workshop. Tourist and accommodation information can be found on the internet at visitmolokai.com and molokai-hawaii.com. Two websites that are generally good sources for inter-island airfares are Kayak.com and onetravel.com Make sure you check your bag all the way to Ho’olehua Airport on Molokai. Your baggage sticker should say MKK. On your arrival day, please remember that check in time is 2pm. Before 2:00, we are preparing for you and we cannot accommodate early arrivals. Check out is by 12 noon on your departure day. That is when the staff begins our clean up and ‘down time’ – your timely departure is appreciated. Please plan your travel arrangements accordingly, and be sure your instructor knows your arrival and departure times. If you fly in earlier or depart later, lunch over the beautiful view at the Hotel Molokai, or a sandwich and Molokai’s own coffee at the Coffees of Hawaii plantation can be a pleasant start or end for your week on the island. ~ Molokai Off-Road Tours & Taxi at 808.553.3369. Directions: If you are renting a car, turn right as you exit the airport. Turn left at the T-intersection onto Highway 460 (towards Kaunakakai), then left again onto the Kalae Hwy 470 towards Kualapu’u. Drive three miles north, uphill, and turn right at the 3 mile marker onto our private driveway. Drive through the gate (press yellow button on post on the left before the gate). Drive to the turn-around at the end of the driveway and drop your bags. Then park above the Lodge between the trees (on your right now) on the side of the driveway , not where you dropped your bags. That area is for loading and unloading only.